Description: COs waiting their turn for a hearing before the Board of Inquiry. Guards stand to the extreme left and right. 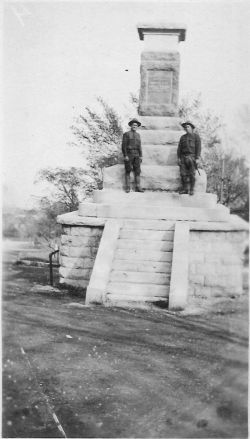 Guard on the right was Manuel Seiker, a regular from Hillsboro, Kansas. 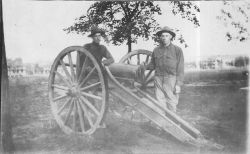 Used in Gerlof Homan, American Mennonites and the Great War, p. 136. Source: Henry Gaede; D. R. Hoeppner? Notes: No. 5. We have negatives. Notes: No. 7. Released prisoner Henry Gaede beside new living quarters known as 3Bn Tents following imprisonment in guard house. 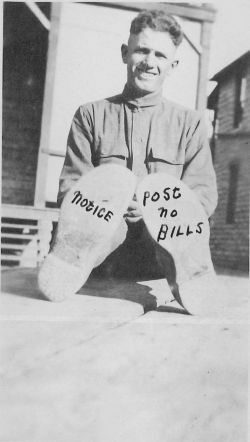 Gaede was put into the guard house following his refusal to march and accept a weapon. Text on photo: "When a feller needs a friend." Notes: No. 9. 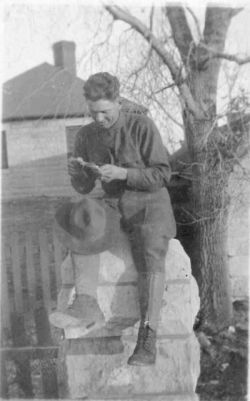 (L to R) Ben Eitzen, A.E. 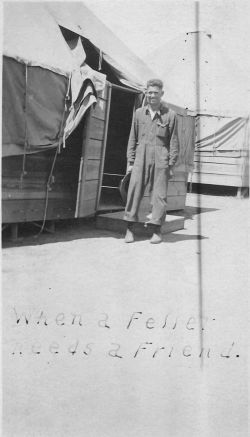 Hiebert, and Henry Gaede in front of 3 Bn tents which served as temporary living quarters for most of the COs.
Notes: No. 10. COs at rest during a hike through the countryside surrounding Fort Riley. They are flanked on both ends by guards. The arrow points to Henry Gaede. Notes: No.11. 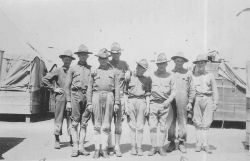 The COs were eventually gathered together into one company (Co. R, 1st Casual Battalion). Pictured is one of the barracks. The three men in the left-hand corner of the picture are peeling potatoes. Notes: No. 12. The commanding officer, with hands on hips, looks somewhat exasperated and disgusted with the entire operation. Notes: No. 13. Chow time. 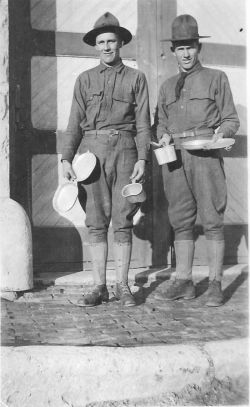 William Knak (left), Henry Gaede (right). Notes: No. 22. Gaede and Swartzendruber wait for a rescue squad. CO in background is drying clothes after having fallen into the river. Notes: No. 25. Note the tents interspersed between the wooden barracks. Notes: No. 29. Gaede noted that the Army "tried to make devils of us" during these training sessions. To teach men to obey orders, they sang marching song together and were made to pick up cigarette butts on command. When told to do so, they marched in formation to trash cans to deposit their collection of butts. Notes: No. 30. In the rush to create an army, men who were incapable of soldiery were inducted, drafted, and sent to camp. 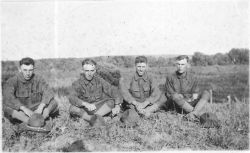 Here Henry Gaede (far left) and Pete Evert (second from right) pose for a picture with some of these men who found their way to Fort Riley. Gaede called them "half-wits." The tents in the background housed one man each. Notes: No. 31. COs investigating one of the many trenches at Fort Riley that were used to ready men for combat in Europe. Notes: No. 32. 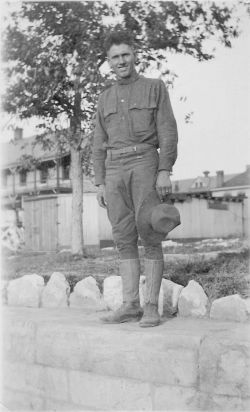 COs in uniform (L to R)-H. Gaede, Jake Nickel (cousin of Gaede). 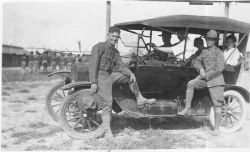 Car driver, Henry Penner; young woman in backseat, Mary Gaede (Henry's sister). Notes: No. 37. Two of the men in the right foreground are reading their Bibles. Description: COs at Marker for Geographic center of U.S.